Main Street - West side pass Jackson St.
1850s This was the location of Dr. Charneaux's French Drug Store and residence (until 1863); a wood frame building with a gable roof and square foot print (Eastman, CSHP). 1871 The lot was owned by V. A. Cross; and now measures ca. 60 feet north to south by 90 feet east to west. 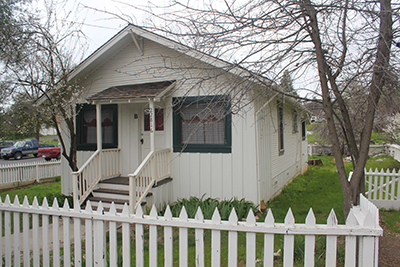 1920s The existing east-facing single story wood frame rectangular building is a Craftsman bungalow with board and bat siding on the front, 3.5” lap siding on the sides, and horizontal boards in the rear. It has a wood shingle roof, wooden double hung 2 over 2 and hopper windows, screens, storm windows, front and rear stoops with porch shed roofs, wood steps, balusters and front newel posts. The rectangular plan (20.7 feet wide by 40.8 feet deep) has a living room, two bedrooms, one bathroom, a kitchen and enclosed front and rear porches. 1920s Jerome Ghiorso, an Italian-American grocery store owner, was the property owner (Eastman). There was a shed on the SW corner of the subject lot, and two walnut trees in the front yard, now gone (1948 map). 1960 The property was acquired by the State, repaired and used as a park residence rental. Physical evidence and old photos indicate that the original paint scheme was all white with dark green window trim. Utility repairs, including electrical and propane heat were performed in the early 1960s. 1975 Fire destroyed the rear porch and part of the attic. 1990s The 775-square foot residence was remodeled/repaired then rented by Daniel Wright and his son Benjamin for 15+ years. The roof is in good condition except for a few ridge shingles. The large Incense Cedar in the back yard has been limbed up, for fire safety, and the roses and grape vines along the south picket fence were pruned to allow fence repairs and repainting. There are fence gates on the front (east), side (south), and end (west). 2010 Additional repair-rehab. work included replacing rotted steps and skirting in kind, re-flooring, carpeting, plumbing, and repainting inside and out plus the picket fence. Two trees in the front may be added to the landscape management plan, pending expert evaluation; volunteer Valley Oaks have been removed. A 1980 granite headstone 24 x 12 x 3.25 inches was found under the front steps by master carpenter Al Hall when the rotted boards were removed to be replaced c.5/21/ 2010. This residence is one of three furnished as vacation rentals and added to the City Hotel concession contract.